Happy happy Saturday!!! It's time for another challenge, number twenty-eight, in the new Compendium of Curiosities III Challenge!!! The Curiosity Crew and I thank you for joining in on the challenges, and of course for all of the comments, likes, and retweets! You all are so inspiring as well! Challenge number twenty-eight is using the Alcohol Ink Ombre technique...a super cool and fun technique to use one of my favorite Ranger products! I cannot wait to see what you make using this technique! I hope you can play along on this challenge so you can win some amazing fabulous prizes donated by the ever generous Tim and Mario, and this challenge's sponsor, The Funkie Junkie Boutique!!! Thank you sponsors for your generosity! You will have two weeks to complete this challenge and link it up to the CC3Challenge site, and you can carefully read all the rules here. Please take the time to visit every member of the Curiosity Crew (See below.) for not only some great Alcohol Ink inspiration, but for a chance to win some extra goodies! Mother's Day is coming! I thought this technique would be perfect for a couple of cards, but once I got to moving, I couldn't help but keep making more backgrounds with more Alcohol Inks. Not only is it so easy, but it's addicting!!! So I've made a couple more cards for any occasion. Seriously, I could have kept on going using every color in my stash. Addicting! 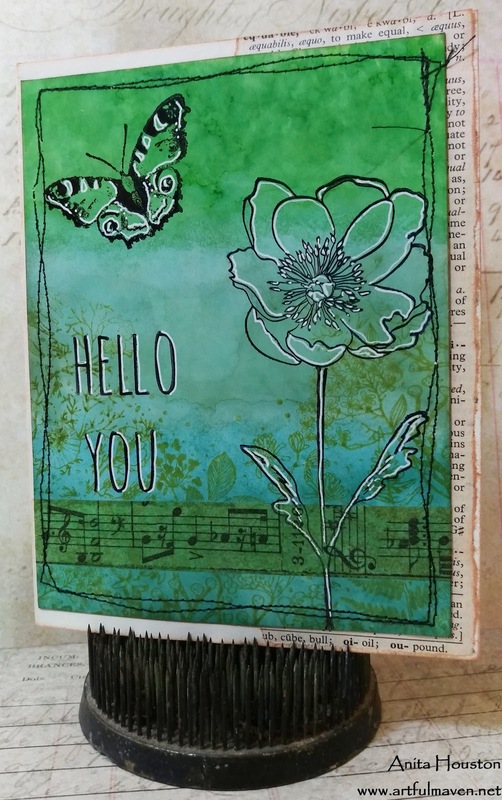 I colored a strip of Tissue Tape with coordinating Alcohol Inks, added it on the cards, and then I stamped the lower portion of the new Botanical Sketch stamp from Tim and Stamper's Anonymous, using Archival Inks that matched. More stamping in Jet Black Archival using the new Flower Garden and Watercolor stamp sets. Then I added the sentiments 'Love You' for Mother's Day, and 'Hello You' for anything else that might come up. I doodled in a few areas in the flowers and butterflies, and around the sentiments. Then I stitched around the cards. Using a Tim ruler as my guide and cut tool, I tore strips on dictionary paper, inked them, and added them to a manila card base. Then I affixed the cards in place. So so easy. I know you will have fun with this technique! AND...Happy blessed Mother's Day to all the women out there with children and grandchildren in their lives! The yellow & green ones are my favourites! I MUST try to join in! HELLO YOU!!!!!! by far one of my favourite cards ever!! i so need to do this.. probably today!!! So, so beautiful! I love the yellow one the best but each one is fabulous! The white highlighting you added really makes these pop. They look like something you'd find in an art museum gift shop. Truly lovely. I'm going to give these a try! Happy Mother's Day, you Beautiful Soul! Really pretty cards, Anita. Love the foliage stsmped in the same color as the ombré background. The black stamping really pops! Beautiful cards! Love the blues!! How pretty,just love the butterflies they are gorgeous. Gorgeous backgrounds!! Love your image choices to go with it too. Lovely!! Have a wonderful Mothers Day, Anita!! Wow Anita, these are so pretty. The simplicity look to them gives them something special, gorgeous!! Very pretty, I've got to buy Tim's book to learn that technique, wonderful results. These are so beautiful. I love the simplicity too - let's those beautiful backgrounds and sentiments speak for themselves. Lovely cards. The matching ink floral background is so beautiful with the effect of the Alcohol Ink Ombre technique. 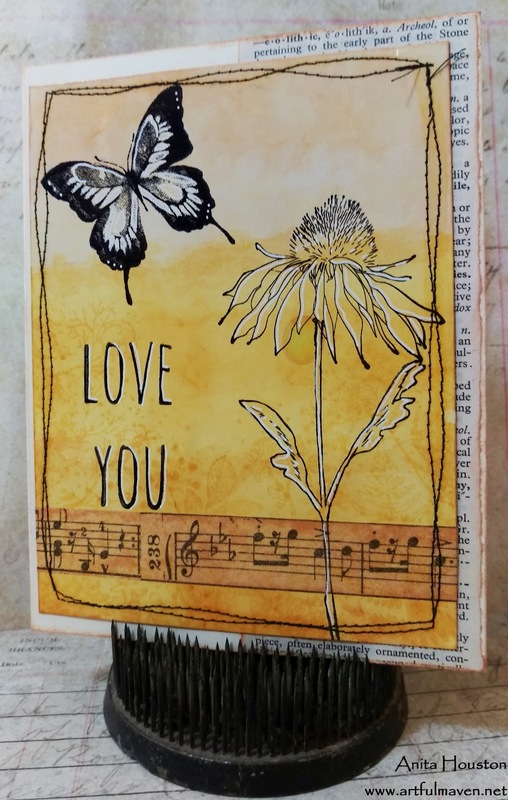 Love the Botanical Sketch stamps and the way you used them here. Thanks for the inspiration. So simple, so lovely!! Smart to make several while you've got your supplies. The white touches are so effective. Love it. Anita, these are wonderful cards for Mother's Day or any day! Love the variety of colors you used with this technique! Very pretty! Hope you had a great Mommy's Day! Anita these cards are fantastic. They are colorful, awesome use of the ombre technique,stunning!! I love the way you used the stamps. What great cards, Anita! Simple and beautiful. 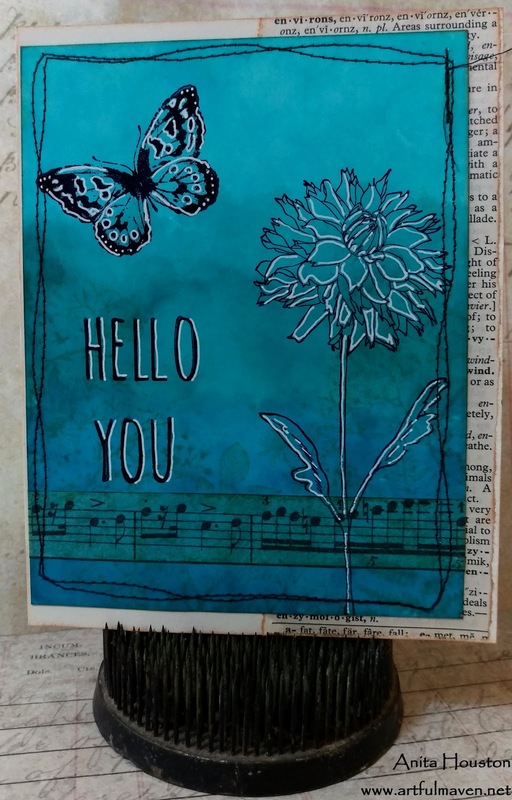 I love the tone on tone background stamping and the highlights of white pen on your black stamping. These are so fun! Anita - you really did an amazing job with the ombre technique! I love all the colors and the finished cards are awesome! I also love the way you highlighted the flowers and butterflies with the white pen! Anyone would be thrilled to receive one of these cards! I just see that you have fun with alcohol ink, have created real jewels for Mother's Day, all the cards are beautiful, but my favorite is the one with the pink shades! What a pretty set of ombre cards ( I can tell you had fun); the colors and your inked background details just so pretty; the floral stamps are awesome... and the stitching pops !! Oh, these are just so pretty and fun! I LOVE the beautiful colors you used. Clearly I need to get more alcohol inks; I've only got about a dozen, and it looks like I'll need at least a dozen more. I love the white accents; I need to try that! 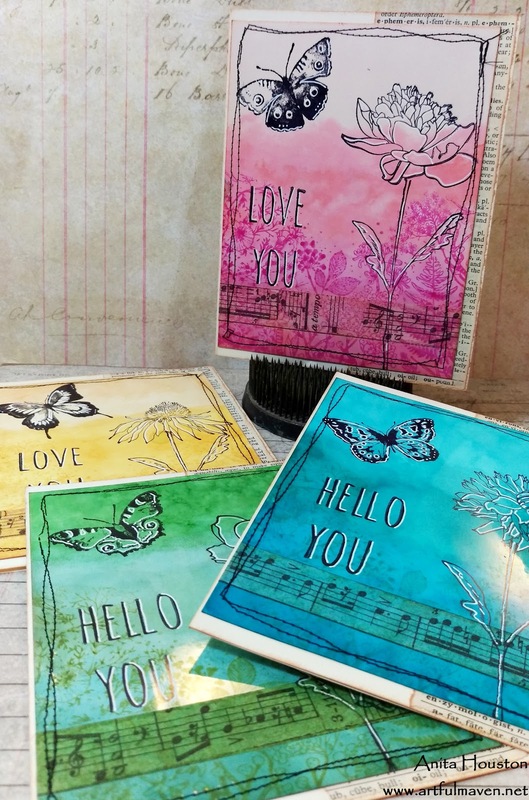 Beautiful ombre work - I love that each of them works within one colour tone, and they let the stamps really shine. The stamping with matching Archival ink just MAKES the cards. Gotta get me some more of those, I guess! This set looks fantastic, love the colors. I love how you have done the different colors on these cards, the same yet different. What a great idea for this technique. Easy? Heheheh - dear me - these cards sure do not "look" easy - they are FABULOUS. Love the writing in the background on just one side... so unique. Looking forward to trying this background!! j.
Wow Anita, these are beautiful! I especially love the yellow one. Off to pin! Beautiful cards. I love the monochromatic stamping for the texture, and the white pen is the perfect touch. Beautiful Spring colours, love all the variations! An entire set?!?! WOWZA!!! & I LOVE all the colors!!!!! 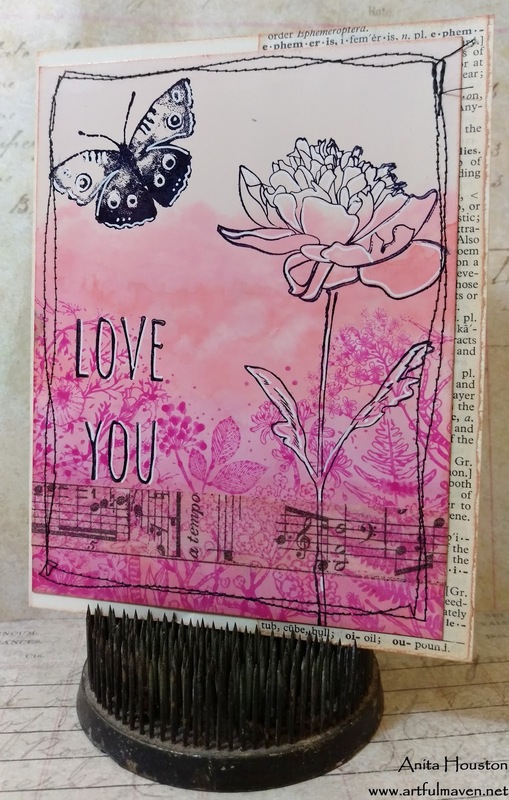 Love how you used the technique and stamps to make your monochromatic cards. They are simply delightful!